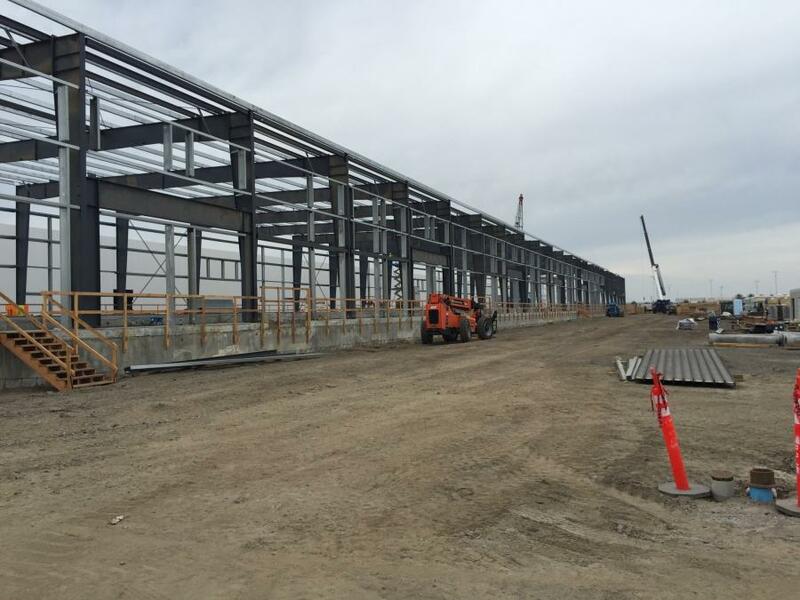 California's Port of Oakland is the site of a $90 million, 25-acre cold storage and distribution facility project that is expected to bolster beef and pork sales to Asia. 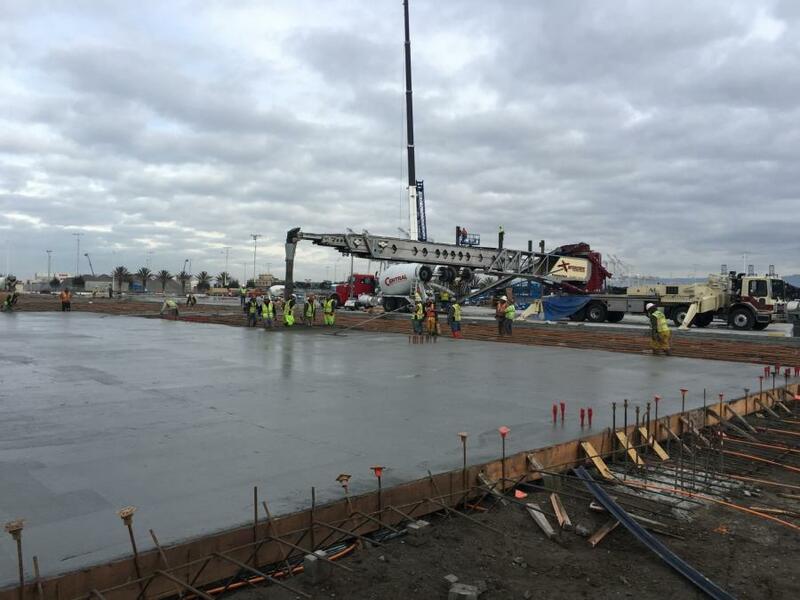 Crews began sitework in May 2017 on Cool Port — an advanced, temperature-controlled logistics for handling perishable cargo such as fresh meat and fruit. As demand grows, train crews will bring vast quantities of chilled or frozen beef and pork to Oakland via the rails for transfer to shipping containers. Shipping containers will be moved across the street to outbound ships. The facility will span 280,000 sq. ft. and is designed to accommodate 36 refrigerated rail cars to be staged within the cold storage facility for loading and unloading of perishables. Phase 1 of the project is expected to conclude in August 2018. Port officials estimate that with Cool Port in place, 27,000 20-ft. containers of meat will be shipped from Oakland annually. The plan is to attract Asian customers to Midwest-grown beef and pork. Cool Port is a public-private partnership between Lineage Logistics of Novi, Mich., Dreisbach Enterprises of Oakland and the Port of Oakland. The partnership goes by the name of Cool Port LLC. Cool Port LLC selected Fisher Construction Group of Burlington, Wash., as design-builder for the project. 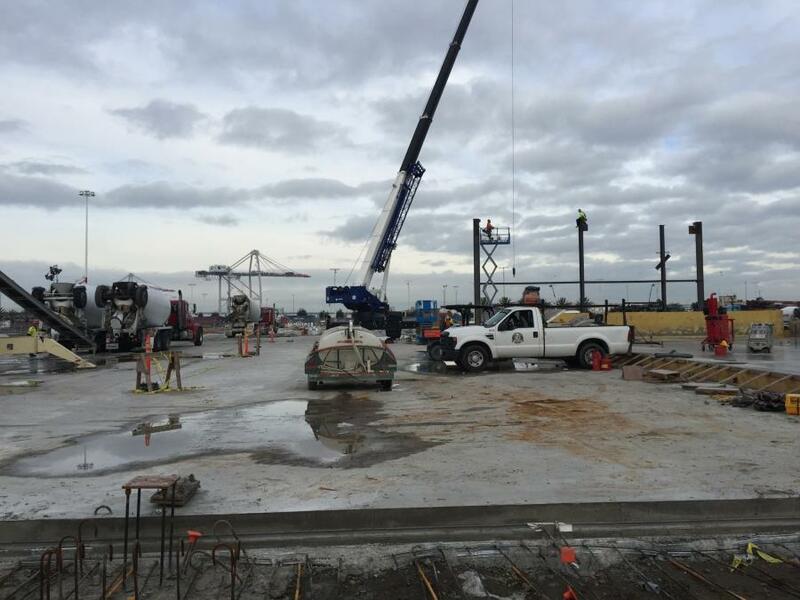 Fisher Construction also manages the project for compliance with the port's strict labor rules. The project features 35 to 45 subcontractors. 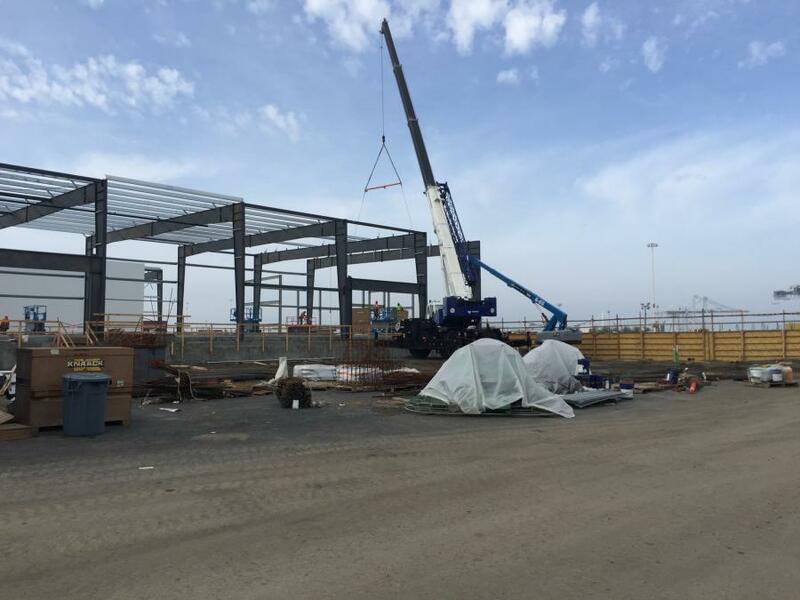 Major subcontractors include Gallagher and Burke of Oakland; Berkeley Cement of Berkeley, Calif.; Collins Electrical of Stockton, Calif.; TDW Construction of Livermore, Calif.; and QEC (Quality Erectors & Construction) of Bonicia, Calif. Between 40 and 60 workers are on the job daily. That number will rise to about 100 later in the project. ATI of Pleasanton, Calif. provided architectural and engineering services for the project. First phase of the project includes construction of the refrigerated transload and distribution facility and supporting rail infrastructure on the 25-acre site. All 25 acres will be hardscaped using both concrete and asphalt to maximize parking for both truck trailers and employees. A full line of heavy construction equipment is at the construction site. Equipment includes loaders, bulldozers, excavators, rollers, man-lifts, a forklift and two cranes for steel erection. The project site is situated adjacent to the port's Joint Intermodal Terminal. Cool Port LLC has the option to expand its operation on an additional 15 acres of land adjacent to the Phase 1 site. The expansion would be part of Phase 2 work. If Phase 2 is approved, work would start sometime in 2024. 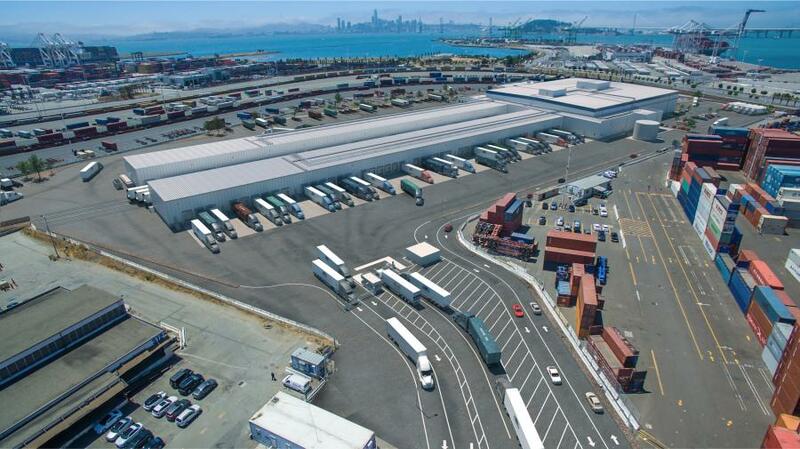 Cool Port will operate under a long-term lease agreement with the Port of Oakland. Cool Port is expected to maximize use of the port's already comprehensive road, rail and shipping network. It has the potential of reducing export costs, while increasing import and export of perishable foods throughout northern California. Cool Port also will provide the latest in technology including electrical plugins for most containers, solar or fuel cell technology for power generation, natural gas power for yard trucks and use of natural refrigerants to reduce potential hydro chlorofluorocarbon releases. The main advantage that Cool Port brings to the Port of Oakland is that it provides much needed cold chain compliant infrastructure, said Mike Zampa, communications director for the Port of Oakland. “Agricultural products play a large role in the Port of Oakland it is extremely important to have an infrastructure in place that meets quality food safety guidelines so that we can continue to service this segment of our customers,” he said. The site of Cool Port is a former Army base located on the tidelands of Oakland Bay. Fisher Construction crews must deal with unknown sunken hazards and potential contamination in the tide flats. 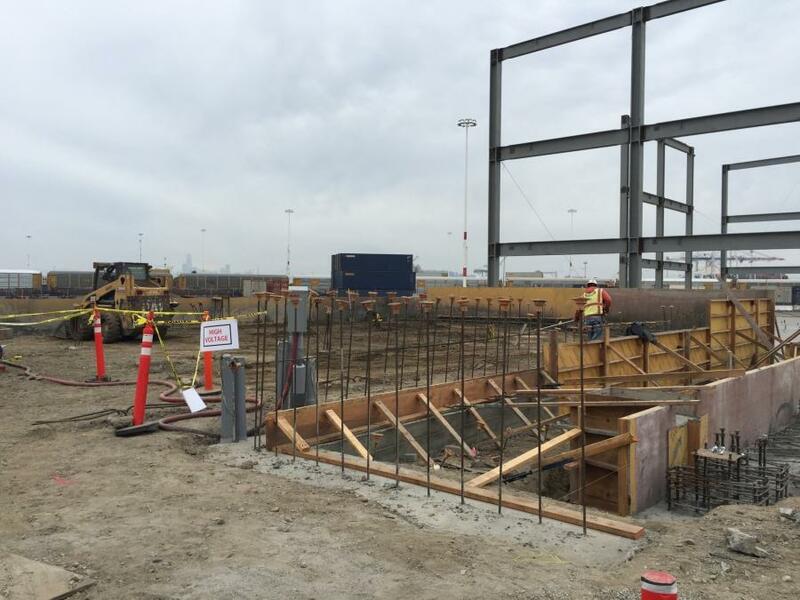 Fisher Construction began the project by driving 1,800 piles 50 ft. beneath the ground surface to counteract settling and to brace the building's slab foundation. As a Port of Oakland trans-load facility, Cool Port will support the fifth busiest port in the United States. The facility is expected to open in August of this year. It will have 36 rail docks and 90 truck docks. Perishables will be stored at minus 10 degrees Fahrenheit in a main freezer or in one of two convertible rooms where items can be refrigerated or frozen. The facility is projected to initially handle 9,000 rail cars and an additional 9,000 containers by truck annually. Cool Port will be connected to Union Pacific Railroad tracks. Burlington Northern Santa Fe Railroad would also have rail access. A rail link to Cool Link from existing tracks will cost $11 million. The project is funded primarily through private investment. The Port of Oakland has agreed to oversee construction of the 2-mi.-long rail spur to Cool Port and to share rail costs with the developers. A $5 million state grant will offset part of the cost. Union Pacific will construct a portion of the spur on its property. Oakland is already a leading U.S. gateway to Asia for agricultural products including meat. Port officials said Cool Port could significantly increase shipments of beef and pork from the Midwest. The products would be exported overseas to satisfy growing Asian demand for U.S. premium meat. Proximity to the docks means cargo could be quickly transferred from rail to ship with minimal cost.